The ending diagonal that I’ve been concerned about all this week is crumbling. In ES and SPX, it looks like we’re going to morph into a contracting triangle. I see that happening across most of the major US indices. The ending diagonal has been questionable right from the third wave, due to the fact that it counted as a ‘5’ until we got the C wave up. But even then, it doesn’t have the right look, and the fourth wave has taken so long to form that it’s ability to reach the downside target in ES before the trendline diverge is not probable. In SPX, it’s all but impossible. So, we’re back to the triangle idea in almost all the US indices, although at a higher price point, and I’m so early in this call that it requires the market to confirm it. I’ve listed my reasons in the explanation under the chart of ES. The key factor is that the US Dollar and USD currency pairs still have to trace out a final large wave. The US indices have to burn some time in order to top at the same time as the currencies. So, while the ending diagonal looks like it’s going to break, a contracting triangle appears to be the ideal solution. 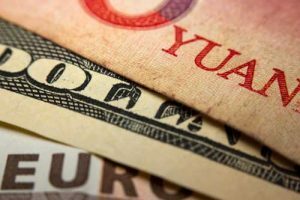 We had a little Santa pre-rally leading up to Friday, but during most of the day Friday, currency pairs and the US indices started to trend down. I expect that to continue through this week. I took at look at all the major US indices this weekend and am showing my preferred count here for all of them. Most of the wave patterns leading up to the triangle are really hard to decipher, so it’s making my job that much more difficult, as we’re still very early in the projected triangle pattern. Volume is extremely low and that can cause waves to be a bit misshapen. We need a few more days for the market to confirm what it’s doing, but in the meantime, I’m providing as much info as I can on each of them. They may all end up with contracting triangles, but at the moment, it’s just a little too early to tell. This final pattern looks like an ending diagonal. In fact, it’s the only index that looks more probable for this pattern than all the others I’m highlighting here. Many of the other indices look weaker and may revert to a contracting triangle. Triangles move sideways, while ending diagonals in a bull market move diagonally up. The ultimate outcome is the same—an eventual new and final high. If a triangle, the current wave will drop lower than for a diagonal. This next wave down will determine the overall pattern, based upon where it finally lands. On the left is the one hour chart of the SP500. I’ve been concerned all this past week about the ability of this index to trace out an ending diagonal because of the slope of the third wave. In an ending diagonal pattern the fourth wave must overlap with the first wave and do it in a way that allows the upper and lower trendlines to converge. Because the fourth wave has not descended quickly, it now seems high improbable that an overlap scenario is possible without the trendlines diverging. Therefore, I’ve labelled the pattern as a contracting triangle for the time being. This means we’re to expect a much deeper C wave than previously projected. It should descend to the lower trendline before a turn up in a D wave. 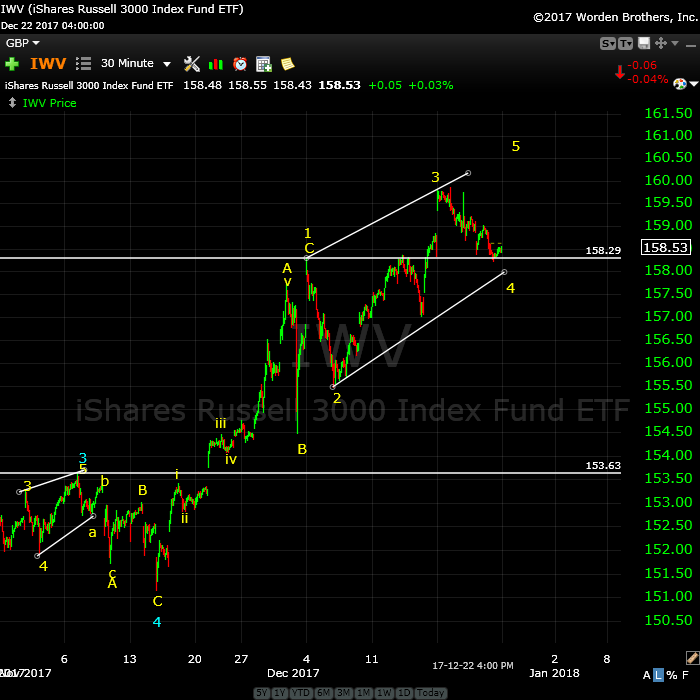 On the left is the 30 minute chart of the Russell 2000 (ETF: IWM). This chart is much more advanced than its sister charts in a contracting triangle pattern, having seemingly completed an ABC wave. There are options with triangles in terms of stretching the time to allow all the related indices to reach a top together. It can widen out for example, creating a more complicated C wave, with a deeper drop to a slightly lower low beneath the current C wave. However, it cannot descend lower than wave 4. We’re early in all these patterns, but this week should provide more information to which pattern is the operative one. 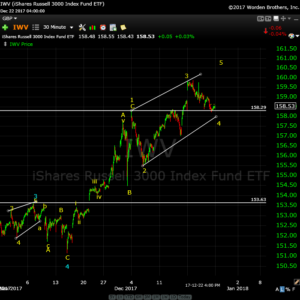 On the left is the 30 minute chart of the Russell 3000 (ETF: IWV). This index is much more advanced in the ending diagonal pattern. However, that doesn’t mean it can’t morph into a contracting triangle, which would considerably stretch out time-wise the eventual final wave to a new high. All the US indices are slightly different in their current position. However, we do know that for the most part, we have a final triangle forming. Triangles in a fourth wave position forecast one final small wave to a new high, just like an ending diagonal does. So, for the eventual outcome, it’s the same. It only affects trading, if you decide you’re going to try to trade the pattern. On the left is the 30 minute chart of the DOW. 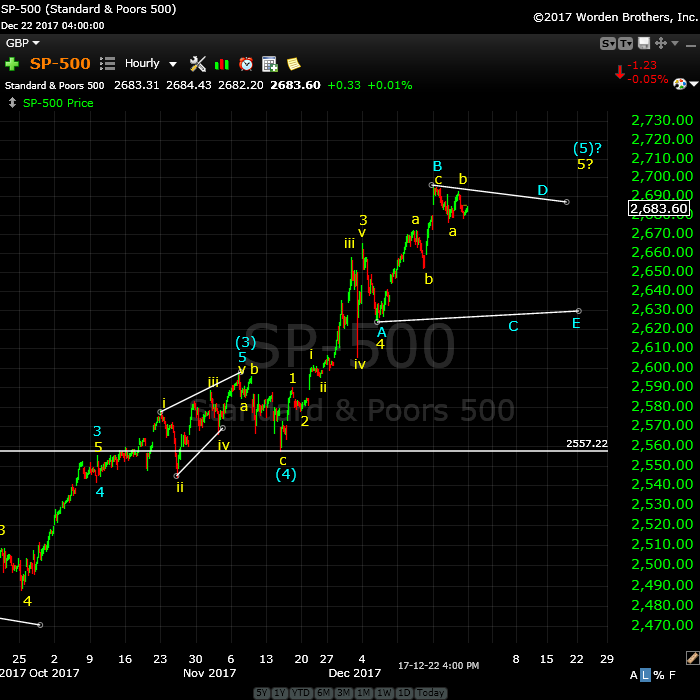 The most recent wave up has risen too far for an ending diagonal to form properly, and wave B in the chart does not look corrective at the moment. So, although I’m showing a possible triangle, it’s more likely from the current configuration that we’re going to see a fourth wave unfold and then a fifth wave up to a final high. I’m on the fence, but we’ll find out once we see what this next wave down lands. It’s still quite early in the pattern. 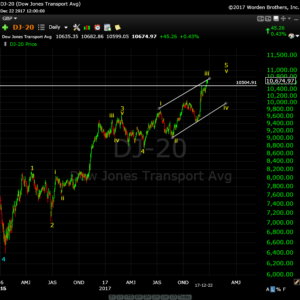 On the left is the daily chart of the DOW Transports. This chart is marked as an ending diagonal. However, the trendlines at the top and bottom are almost parallel, so it wouldn’t surprise me to see this morph into a contracting triangle. That would mean wave iii would become the B wave, while wave 4 would take on the role of the A wave as well as wave 4. It looks like after showing considerable early weakness well ahead of the DOW, this index has regained its strength and is about to top with the rest of the US indices. However, my previous expectation of an ending diagonal is changing. It looks like we're morphing into a contracting triangle. More on that below. Volume: I'm seeing volume rise when the market comes down and subside as it rises. This, of course, is a very bearish warning. Summary: The count is full for the US market in general, except for small subwaves that form the balance of a motive set of waves in SPX and some other major US indices. I'm leaning towards a contracting triangle as the final pattern, rather than an ending triangle. Last weekend, we knew we were dealing with a triangle of some type. Last weekend, it looked like a contracting triangle was not an option. However, with the wave structure now more advanced, there are compounding reasons to believe we're going to trace out a contracting triangle (not the original one, but one at a slightly higher price level) after all. Currencies (including the US Dollar itself) have one more large wave to trace out after bottoming in the current fourth wave. This suggests that the US indices are going to take more time (not a significant rise in price) to trace out a final pattern that would allow everything to top more or less at the same time (which is what I've been calling for, for well over a year). Currency pairs still have to bottom in their fourth waves, which is still a significant drop from where they are, which suggests a larger drop in ES than to the 2650 area (of an ending diagonal). 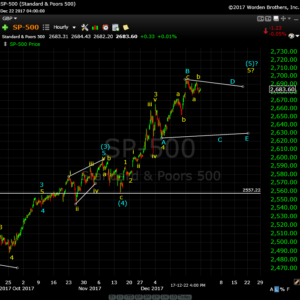 The drop in the fourth wave is so far very slow, and as time progresses, there is much less chance that it will hit the ending diagonal fourth wave target before the upper and lower trendlines diverge (which would "break" the ending diagonal). The SP500 has little chance now of completing an ending diagonal for the reason given in point 3. At this point, I have to leave it to the market to tell us what the operative pattern is. Short term: The wave larger count is now virtually complete. We're tracing out a triangle of some sort. I'm leaning now towards a contracting triangle as being the operative pattern; however, we need confirmation from the market. the sp 100 index . ill keep my stop at its all time high which was on dec 18th . high are based on something else . the move up from the dec 1 low to me is suspect. not an Elliot wave rule ( this breaks rules ) yet it has an ending look to it . 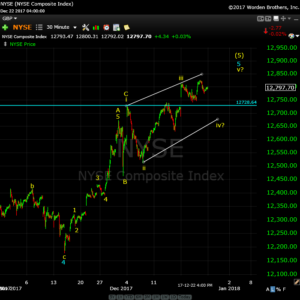 bottom line what ever this corrective wave is , it does not seem complete . Fridays low being a higher low its to early to call it . 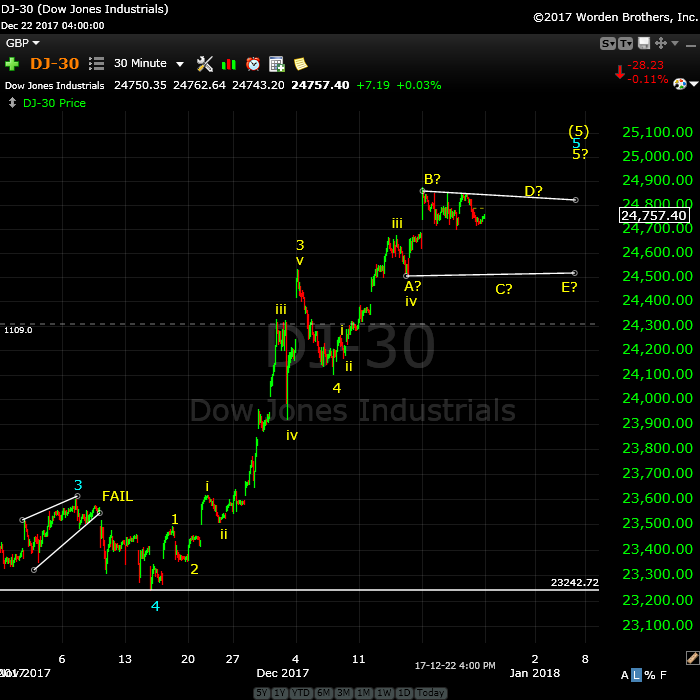 Utilities look to have further downside coming yet can be in a minor 4th wave . 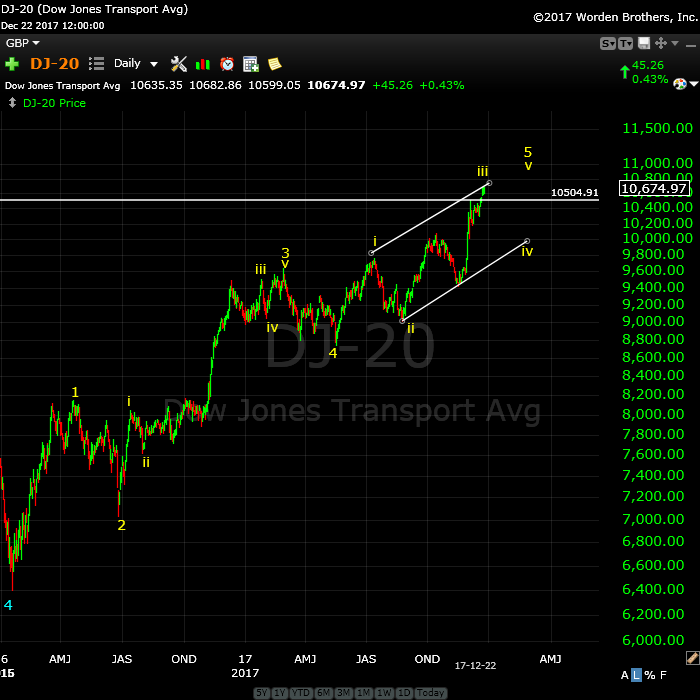 Honestly though the dow looks very stretched more like a 3rd wave extension than a final 5th . If so my timing model is out of sync with the dow and stock index’s . Your triangle prognosis does indeed make sense . on the futures market in which I have the ES+NQ+YM added together . My vibrational timing projects the low 8/20/23. The nice thing about vibrations is that they show up everywhere. But this shouldn’t surprise us as vibrations are the source. Everything else is a vibrational expression, I see a low 2/22. And on that date mars is parallel Saturn. Confirmation? Not in my world. Just the vibration that rules everything. Turns out the 8/20/23 date is conjunct the solar eclipse in 2024. Surprising? No, solar eclipses are vibrational expressions. Everything – including you and me – are vibrational expressions. How is that for a christmas thought? It really starts to get boring. Everywhere I look I see the same date. Can give you a many examples, but I won’t. In short; 12/29 will be a high and 1/2/18 a low. Then 1/3 high, 1/4 low and 1/5 a significant high. Then things will speed up a bit into the 1/10 low (1/7 low, 1/8 high). From 1/10 up the very signifcant 1/15 high. Gave this date last week and have just found more proof. After the 1/20 low we are up into 2/1 for a 3rd wave down in the first wave. This low will come 2/11. Then test on 2/15 high and down into the very strong 2/22. From there up for a higher level w2 up into 3/27-ish. That will be the spring high and start the leg down into the vibrational 5/2 low. Then up into early june 4 or 5 and then down into 7/10 – ish low. This concludes the fist leg down of some sort of first leg. This all fits into the major cycle that targets august 23. My best estimate for what comes next would be a high around 2027, a low 2032 and a high again into 2036. But this is just for entertainment, Thought this was appropriate for this time of the year. So; things are brewing. 1/5, 1/15 and 2/1 are the dates to watch. panic wil rise in steps. Slowly at first as we have years to cover into 2023. On a larger scale 2019 will be much more volatile than 2018. But It all starts in 2018. In january. Are there is no stopping this thing. For the astro-minded : 7/13 we have HC Jupiter Contra parallel HC Neptune. And 7/12 we have GC mars conjunct Neptune. And this will be 2 weeks before the total lunar eclipse. Early june we see gc Mars conjunct Jupiter and 6/5 HC Mars contra parallel HC Saturn. So the planets confirm two major period for change. But as stated above; for me this is not a real confimation, Just the vibration going wild. Hi Willem, are you still a member of Dirk? under Mike D. shows his gmail as well . before making any decisions on direction . Staying short at the moment . a simple A B C decline . the NYA made a new high today ? not nearly as bearish as others . something I watch for is an 8 year and 15 year low to high movement . from 2016 low and 2009 low which is 2024 . that is a long ways away . benner business cycle calls for a 2018 high and a 2021 low . a dec feb 2021 low so I have doubts of an extension into 2024.
would be extremely bearish . ( agrees with peter ) or ………. we are in a massive 3rd wave which targets much much higher prices ( despite my cycles work ) . The utilities on a monthly multi year chart should be watched as well as the transports . I have mentioned that I see many similarities today with the 1999- 2000 top from a cycles point of view the difference I see is bitcoin vs nasdaq 100 .
what I ” think and see” at the moment . was buying into the crypto currencies and she asked me what I thought . The late crowed to the party appears to be the young crowed . Call it animal spirits , call it a bubble , call it a blow off or what ever . Unless the market proves me wrong ( I don’t want to see any new highs in the index’s after march 17th 2018 ) I have a bearish bias into april 2018 and longer term into January 2019 . after that ill change my view based on the data . Sticking to my longer term 1 year thinking until proven wrong . I certainly could be mistaken, but there are not too many patterns that I trade with high confidence, and triangles happen to be one of them. Based on my expectation that the sideways movement of the last several days is a triangle continuation pattern of some kind entered in an uptrend in ES, I expect an upside break-out with a target of 2730. I remain long the market via SPY 267 strike calls and plan to exit with a break of 2700.00 to the upside. The last thirty or so points I will use to get positioned for an anticipated reversal. Best of luck in the new year to all! Looks like the USD is getting ready to rip higher and the Yen is looking like it wants to drop send USD/JPY higher. would be 5 waves up . The us dollar monthly chart DX is the opposite. also id like to mention the $util index . ill mention it just because . 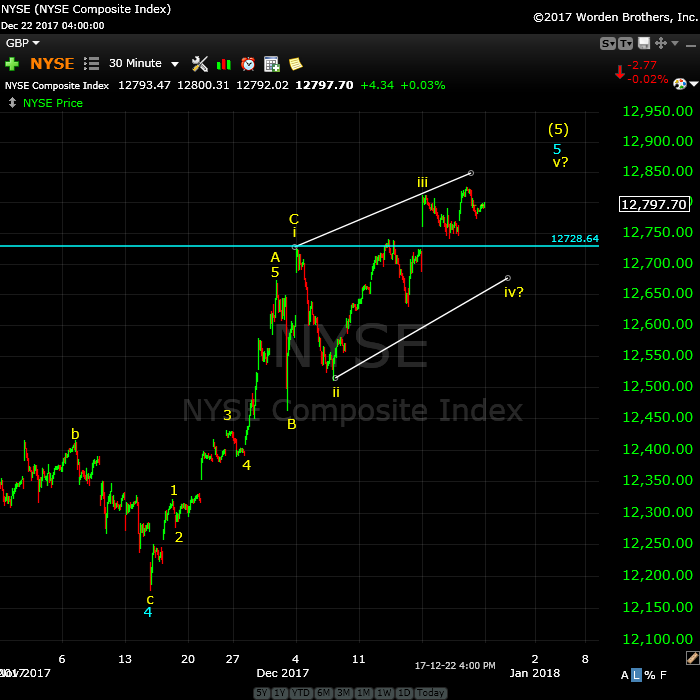 to the swing low dec 14 can this be considered a RARE leading diagonal wave 1 ? ending diagonal and so this rather steep turn downwards should be expected. Obviously there is a much more orthodox wave count which does not break any rules. 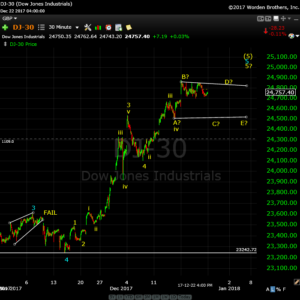 in which case we would be in a minor wave 4 of wave 3 down still. Both counts appear valid to me anyways and both are bearish if this continues. the bullish guy on here for the past couple years . position yet its not as clean . The ES i have issues with it being a triangle . yet is still slight positive . Looks to me Joe that we just got done with D as well. The contracting nature of the possible triangle means E should complete soon with an upside break if I am right. A move much below 2680 says I am wrong. I have a trigger finger ready to exit bull put spreads and calls on any upside break. No more comments from me . What does EC stand for or mean? The Moon will be close to the maximum Perigee with Earth on 1/1/2018. The previous position this close to the Earth was on 14/11/2016. Don’t count on a swing on the date. Give it 2 weeks. Why? Dunno.. It would probably be helpful to readers if you stated what the relevance of this event was to market price. I took a look at charts on that date specified and was unable to make a connection. By my count contracting triangle in ES just about done. Either we see a break-out upwards in futures starting quite soon or I got it wrong and something else is developing. The Moon = gravity and energy. The closer the Moon is the Earth (Perigee), the greater the energy, such as higher king tides. Humans are comprised mostly of water. The Moon was at a perigee of 356755 on 26 October 2007. The 2007 top was on 11 October. Not an insignificant date. The perigee on 1 January 2018 will be at 356566 miles. The link will get you started. the “The perigee on 1 January 2018 will be at 356566 miles” is significant. Actually he already did. The theory is the proximity of the moon has a salutory effect on markets and market highs tend to occur at perigee. For most traders, a roughly two week window is entirely acceptable….unless of course you are in mood to quibble. He posted what he did in direct repsonse to a query from me I would politely remind others in a critical mood…. another time, another board, another poster, led the unsuspecting down the perigee rabbit hole…do you think they found anything of genuine value? do you think this time is different? Looks to me like we are done. I am out. Indeed luri, my friend, indeed! We might just be looking at a top here. I would have to count ES complete. The question is what happens with the other indices, which are not at new highs. So we might not quite be done. so in our indexes, they have been turning in unison…….., and making new highs in unison…………..just like the grazing herd – well, until the very last moment???? is it reasonable to expect that at the moment of “strike”, that the indexes will “mimic” nature??? the “key” is ……..thick wool socks!!! !…………………they won’t hear your coming if you wear ……………..thick wool socks!!! ……………..trust me………..! as the us dollar index . The utilities ( $UTIL ) to me is still in a developing 5 wave decline . the top was on nov 15th and the wave 2 top was Dec 1st . as long as this index stays below 737 ill consider the wave count as valid. so far i see ( 1 ) ( 2 ) and waves I II III and we are in wave IV of ( 3 ) down. rally failed to take out the dec 27th high . this places today’s high as key . 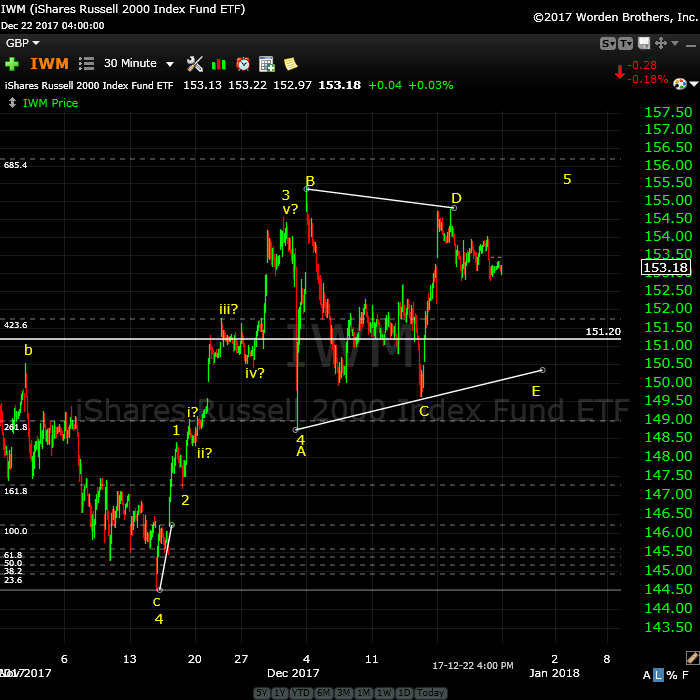 ( $ TRAN ) . Nasdaq 100 from a bearish point of view . Nothing to go on , no triangle formation that i see which is valid . alternate counts both bullish and bearish yet nothing solid. Dollar index : a 5th wave down on a monthly chart appears to be most likely . in the time frame of jan 9-18th . where the market sits in mid January will be important for me in regards to the bull bear debate . Lastly : the gold silver ratio in my opinion has still not hit its target. this leaves me at odds with the gold stocks which im itching to buy . If the us dollar is in a 5th wave down then this rally in the gold stocks would most likely be short lived and new lows would follow as the us dollar turned up . it is beginning to look like bond prices may hold up yet longer term i tend to doubt it . Wheat: the swing low on dec 12th is now the key price time level im watching. breaking below that dec 12th low id consider as Bearish despite my bullish bias . 5 waves down on the daily chart which is plain to see obvious ! Possible Multi year triangle formation unfolding . as is the 2017 high at 1362.40 . 1362.40 and then a drop to the 1200 level at a minimum . The rest of this requires market closing numbers . Not 1 index made a new high today . Well, NYSE did, by my chart. unofficial sell signal today . the pivot dates for January 2018 cause me to believe that volatility may be returning to the stock market…Happy New Year! its a simple A B C decline and not a triangle. No Sell Signal given which is amazing . Today’s /es, /nq, /ym action is reminiscent of Aug. 8 action albeit swing high at/near open. Watch VIX & VXN. Both seem to be eyeing upper BB line. C wave low by my count. The one final thing that was quite probative for me was the filling of the 2675.81 open gap from the December 15 close. If the fat lady ain’t singing, she sure is clearing her throat, it would seem….! All-time high. Also it counts as an outside day reversal . To me this allows for another new high in at least 1 index . Can be Dow or oex or spx yet I’d prefer it not in the NYA again . The next cycle high for me is now the mid January time frame . Entry for a bearish trade . Yet it would not change the bearish implications of the bearish mars Uranus cycle . I’d prefer they stay in sync yet my preference vs the market is not important . I’ll post an updated chart of both mars Uranus as well as puetz on Sunday by the latest . 26-31st which is both , the lunar eclipse ( related to puetz ) and a swing high Jan 26 related to mars Uranus . Or begin from . It should not be all time highs ! Staying bearish into Tuesday yet I’m not going to ride these swings back up again . At best I’ll probably end up with a break even since I entered to early . I don’t think anything has changed since last weekend. 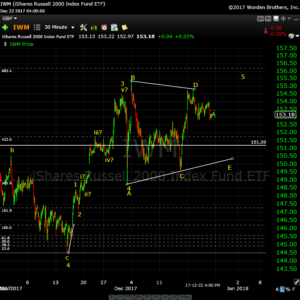 I have us (in US indices) in a large 4th wave triangle, which is only starting to play out. I’d give it a couple of months in order for currencies to finish up. We’re waiting for the US dollar, which controls everything and it still have a little ways to go … as I’ve been saying. Last week I said 12/29 would be a high but that 1/5 would a more significant high. 12/29 was a high and 1/5 will be a high. Expect SNP to touch 2750 1/5/18. This is a vibrational price. If SNP does that we have special time price squaring out. The same system predicts 1738 for august 2023. That would be -55%. This happens to be the same as the 2007/2209 decline. But that is coincidence. When we turn we are down into july /august, before we do a significant retrace. I’ll be working on projecting the target for the retrace, probably late 2018. 2019 will be very bearish. Said it before and will say it again; the vibrational cycle is down into 8/20/2023. As vibrations rule the universe This WILL happen. It is what Gann called cause and effect. When I throw something out of the window it will go down. This is not a prediction; it is Newton’s law. Cause and effect. Gann knew of Newton. That why he called his own theory the LAW of vibration. It is a law; not a prediction. It works mechanically. Because everything is the vibration. 1/2 wil be a low. ABC up into very strong 1/5 high. Vibrational dates 1/5, 1/10, 1/15. 1/20 and 2/1. 1/5 and 1/15 likely double top. After 1/15 definately down into july low. 3/26-27 will be spring high and then a 3rd leg down into 5/2. Best of wishes for 2018 for everybody. An interesting link if one is so inclined to read because of the author. 6/18/1996 = 6 – 9 – 1 9 9 6. For the year, yyyy format, the first two numbers, 1 and 9 will remain. Notice 2 pairs with a‘9-6’combo. For the 2 pairs, turn the 9 upside down to get 6. Now you have 2 pairs of 6. 6+6=12, 6+6=12. 1+2=3, 1+2=3. Now move the 33 to the last yy. You now have 1933, the year President Paul von Hindenburg appointed Adolf Hitler as Reich Chancellor of Germany. 1933 was also the year the 1929 crash bottomed. One could also turn the 9 upside down so you get the year 1633 instead of 1933. Tulip mania started 1933. “By 1633, rather than bother with guilders, the Dutch even began using the bulbs as a currency themselves. There are numerous records of land properties being sold for bulbs.” I read an article recently stating people selling their homes in exchange for bitcoins. Thanks Andre. Absolutely fascinated by your take on the significance of vibrations to market price. It is the very first time I have heard an application of string theory to the markets. If we are in a barrier triangle, the 2750 target is reasonable. Until that brutal ES reversal, I actually had a 2730 target. Strange times! Verne; I just gave you what my systems tells me. God knows what the world will be in 6 years. I just gave a reference point. We’ll see in 6 years. What struck me was that my system gives the same decline as in 2007; 55%. I have a strong confidence this price level will give A low; as it is vibrational. Will it be THE low? Who knows. The fact that 1/5 will be a high is a fact. But 2023? Just give these facts to inspire people and trigger a discussion. Think that is the purpose of this site. Thank you so much André! Best wishes for 2018 to you as well. Hope you start using Twitter. 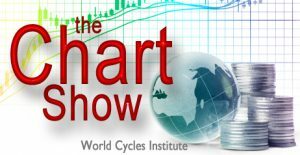 I followed you from solarcycles.net to this wonderful site, but am concerned that this site’s comment section may be closed soon. can you explain this one???………….. SPX 07 – 08 top high was 1576.09. Dow also had a down March. Not finished going through data yet im back to that 1984 cycle low again . 1984 + 34 years is 2017 .
equal distance in time from low to high . ill need to check actual prices . both need to be check . fairly close to the 2007 high. or get excited about yet i find it interesting is all . is almost a 50 % move . how will the market react if it gets hit . i would not make trading decisions off of that . Computer problems so took a break. ill get something decent finished up tomorrow. from what i have looked at earlier today . I have seen a few counts that says we’re done. No truncation in ES but there would be in SPX. That thrust out of what I had as a triangle was a textbook (IMHO) completion of a final move up with a classic quick reversal; impressive to say the least. It behaved exactly as I would have expected from a completed ED. Tuesday’s action is going to be a great import. I expect we will get a heads up from the futures action Monday evening…. so you are not anonymous. Credit card transactions are given to the irs . don’t think the bank doesn’t know where that money was sent to . all what some claim it to be . if it turns out to be really bad there is recalls and class action law suits . so were going to store our money online ???? your money is not insured etc…..
take your principal out as fast as possible . Nasdaq 100 in the late 1990’s on steroids . we are going to change the world etc… all over again . Enjoy the ride if you choose but it ends badly . Bottom line: Its not what it appears. Ill focus on the markets and leave that AI Block chain and crypto’s out of my posts . According to Martin Armstrong no peg will ever hold . This is just something to look into . Yet developed that I know of but is coming . The most important indicator gives a low on the 4/5th. In fact the whole month is declining till 25th-opening US. Further i cannot calculate it yet. Willem, could you share what kind of indicators are referring to?